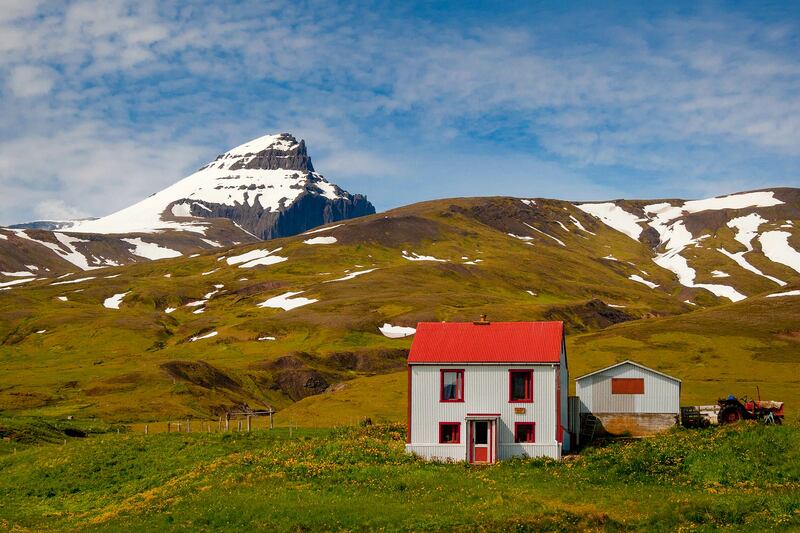 Witness the beauty of East Iceland on this five-day trek. If you love hiking, wish to avoid the crowds, and seek a unique experience that combines both natural and historical sites, then this is the tour for you. This tour begins at Egilsstaðir airport; you can reach it by car, or else add a flight from Reykjavík during booking for an additional cost. 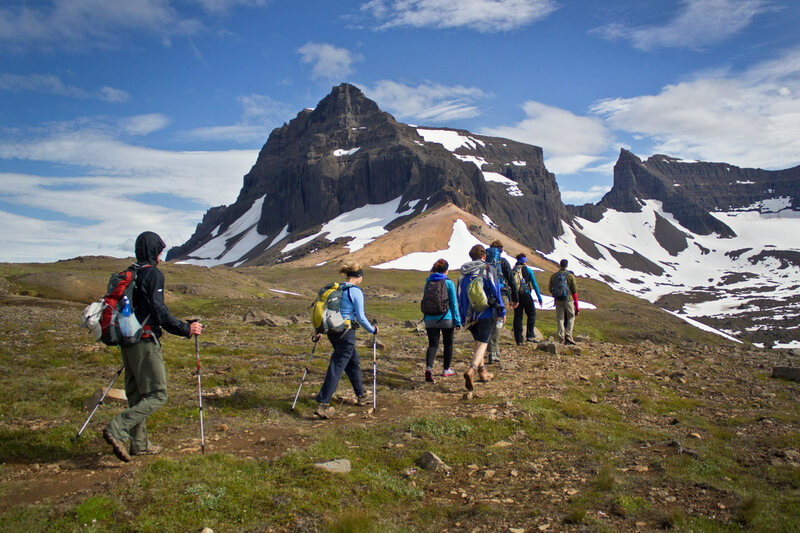 Once the group is gathered, you will head to Borgarfjörður Eystri to start hiking the pass here. This route leads you to a beautiful enclave below the Dyrfjöll Mountains, called Stórurð, where you will enjoy lunch before heading north. Once you reach the ancient farm of Njarðvík, regularly referenced in the Icelandic Sagas, you will be transferred to the nearby village of Bakkagerði, for dinner and rest. The next day will start with a hike to a hidden cove called Brúnavík, where you can admire the lapping waves of the ocean in peaceful solitude. Following this, you will head over the pass of Súluskarð, for spectacular views of the surrounding hills and mountains; the diversity of scenery and vivid colors make this a fantastic spot for photography. You will then descend to two more deserted, beautiful little inlets, firstly Kjólsvík, then Breiðvík. The third day will take you inland a little, out of the vividly colored Breiðavík valley, and to the mountain of Hvítserkur. Weather permitting, you will ascend this stunning peak, to attain some magnificent views. 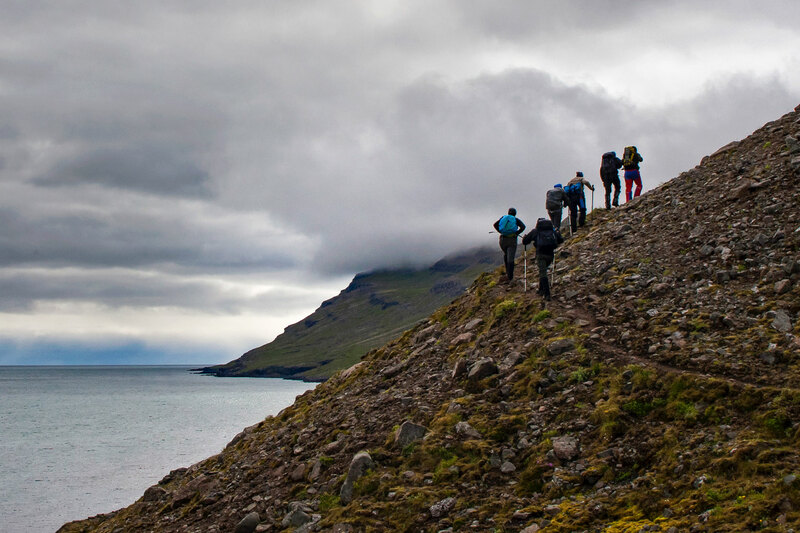 Your descent will take you to another inlet, Húsavík, where a mountain hut awaits. In the evening, you can visit a historic, but now abandoned, church, or take a serene walk along the nearby beach. For day four, you will hike through a valley to the site of an ancient rockslide, in which an enormous mountain almost collapsed in its entirety, inspiring folklore in the area. This area, Loðmundarskriður, is surrounded by beautiful peaks and desolate nature. Close to here is where you will be spending the night, at the stunning fjord Loðmundarfjörður. There is another old, abandoned church worth a visit to this area. On your fifth and final day, you will traverse the same path of historic Icelanders as they made their way from the farms of Loðmundarfjörður to the trading harbor of Seyðisfjörður. Ascending the mountains here will provide you with unbelievable views of the fjords to your south, and as you come over the crest of the peaks, the fjord of Seyðisfjörður will come into view. The descent is awe-inspiring, as you admire the mountains that tower over the narrow water and little town. Once you reach the main road, you will find a bus waiting to take you back to Egilsstaðir airport, where those from Reykjavík can jump on their flight back to the capital. Do not miss this opportunity to see some of the most beautiful and lesser-known natural and historical sites in Iceland. Check availability by choosing a date. Seyðisfjörður is a town and municipality in the eastern region of Iceland, tucked into the most inner corner of the fjord that shares its name. Surrounded by snowcapped mountains and waterfalls, the most prominent natural landmarks are Mt. Bjólfur (1085m) to the west and Strandartindur (1010m) to the east, both of which are a part of Iceland’s seven peak hike. The settlement of Seyðisfjörður began to develop into a trading centre in 1848 when townspeople found their wealth in “the silver of the sea” - herring. The long protective fjord gave the fisherman in Seyðisfjörður an advantage over their neighbours, leading it to grow into one of the most prosperous towns in East Iceland. The unique, multi-coloured wooden buildings that make Seyðisfjörður so recognisable were built in this period by Norwegian merchants and whalers. The ruins of their whaling operation at Vestdalseyri can still be visited along the Seyðisfjörður coast. In more recent times, Seyðisfjörður was a base for Allied forces during the Second World War. The one attack recorded off Iceland occurred on the British oil tanker, the El Grillo (“The Cricket”), which was at anchor in the fjord. After being heavily bombarded by German fighters stationed in Norway, the El Grillo’s captain made the decision to scuttle the ship. The El Grillo was sunk without loss of life and now rests at the bottom of the fjord. The wreck is now a popular sight amongst scuba divers. Seyðisfjörður’s steep-sided valleys make the town prone to avalanches. An avalanche in 1885 killed 24 people, making it the worst avalanche tragedy in the young country’s history. A memorial for the dead now stands in the town, constructed from the beams of a destroyed factory. More recently, in 1996, an avalanche crushed another local factory. Thankfully, no one was injured. Avalanche dams, some as high as 20m, have since been constructed around the town. 17km east of Seyðisfjörður is the Skálanes Nature and Heritage Centre, a hub for scientific and conservationist exploration. The reserve, covering over 1200 hectares, is known for its diverse wildlife, boasting 47 species of birds, 4 species of Icelandic mammal and over 150 species of plant life. The diverse range of habitats covered by the reserve—freshwater wetlands, intertidal, cliffs, meadows—have attracted researchers from overseas, making Skálanes the perfect example of international and academic cooperation. Developments from Skálanes have been made in such far-reaching disciplines as archaeology, anthropology, linguistics and environmental conservation, to name only a handful. Dyrfjöll is a series of mountains within a great mountain range that rests between fjord Borgarfjörður Eystri and the municipality Fljótsdalshérað in East Iceland. The mountains get their name from their most famous feature; a large gap called Dyr which translates to “door”. The mountains’ highest peak reaches 1,136 metres (3,727 feet) above sea level. The mountains are central volcanoes with two major silicic phases of activity that produced a myriad of calderas which are brightly visible throughout the volcanic field. Just below Dyrfjöll lies Stórurð, one of the highlights of East Iceland, which consists of large tuff boulders, scenic ponds and meadows. The area can be reached through the pass of Vatnsskarð. Hiking through Dyrfjöll is considered challenging, but very awarding. The hike usually begins just outside the town Jökulsá við Bakkagerði. The route begins calmly enough, but as you reach higher levels, you are greeted with steep ridges filled with permanent patches of snow. The hike goes all the way up to the specific mountain of Ytra-Dyrfjall, but only the experienced few reach its peak. The first time in recorded history in which the peak was reached was in 1952. When hiking in Iceland, always remember to prepare and submit your travel plan here. Flight from Reykjavík can be purchased as an optional extra. If you have purchased flight you will need to be at Reykjavík airport at 06:45. If you are already in the east and would like to meet the group in Egilsstaðir you will need to be at Egilsstaðir airport at 08:30. Powder drink mix – Icelandic water is great – but you might like a bit of variety. Some also contain vitamins and minerals that help your body after a hard day. 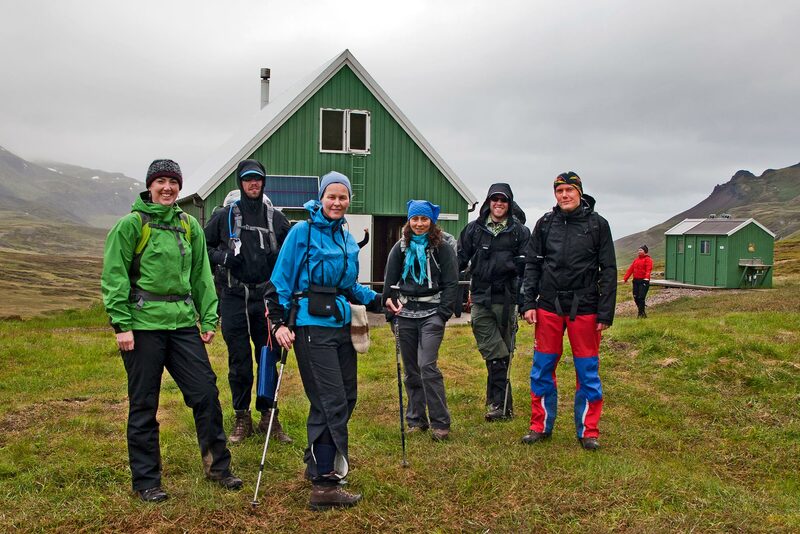 Your first day will officially start when you meet your group at Egilsstaðir airport. If you cannot get there yourself, you can add a flight from Reykjavík Domestic Airport in the early morning. You will be driven to Borgafjörður Eystri to begin your hike. 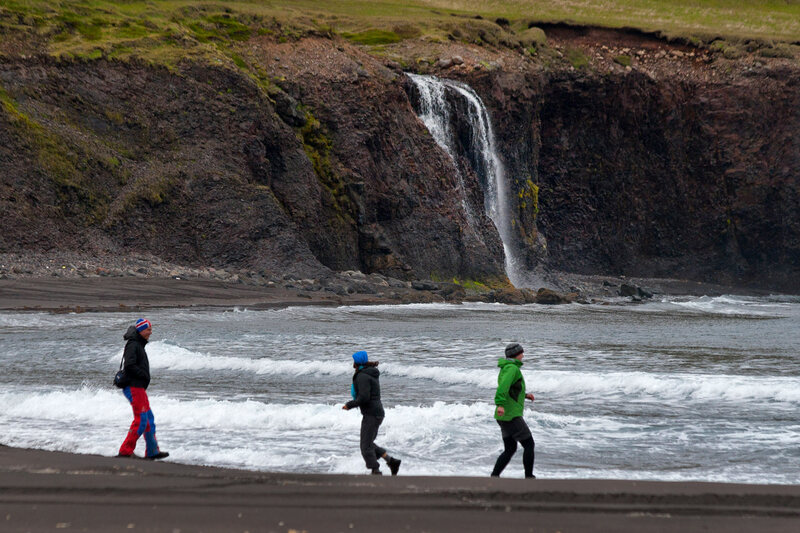 You will head to an oasis in the Dyrfjöll mountain range called Stórurð, where you will lunch amongst some beautiful scenery, before continuing to trek north along said mountains. Near Njarðvík, you will be picked up and taken to the charming little settlement of Bakkagerði; here, you will have dinner and find your accommodation. The second day will consist of hikes to three remote inlets. The first of these is Brúnavík, a peaceful spot where you can watch the North Atlantic waves come rolling in. 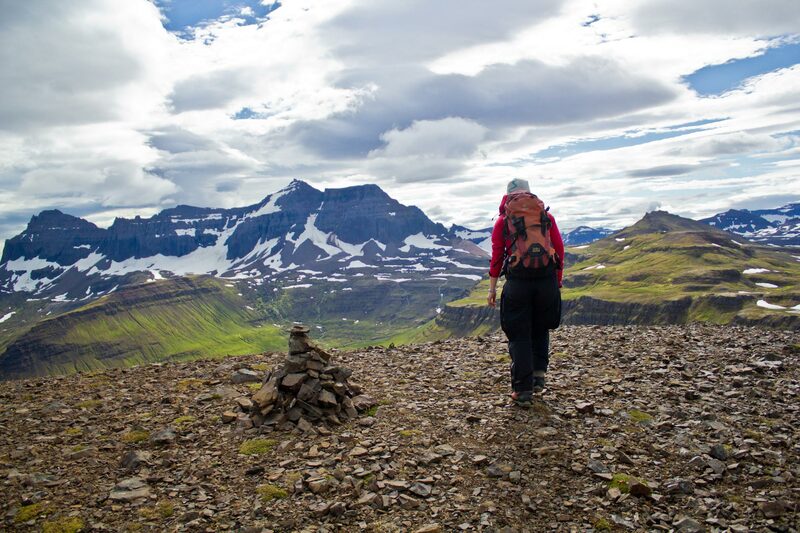 You will then trek up the pass of Súluskarð, the views from which are spectacular and vividly colourful. You then descend to the little cove of Kjólsvík and have a chance to admire its beauty, before continuing along the pass of Kjólsvíkurvarp. This will take you to the largest of these inlets, Breiðvík. You will spend the night beside this picturesque beach. You will start today by hiking up and out of the valley of Breiðavík, towards the mountain Hvítserkur. If the weather allows, you will ascend this peak. The views from up here are spectacular, granting you a beautiful panoramic of the surrounding area. Once this has been fully appreciated, you will descend a narrow valley to another quiet cove, this one called Húsavík. Your cabin is waiting for you here. If you have the energy after the hike, you can use your evening to take a stroll along the beach. There is also a historic, quaint church nearby that is worth a visit. On day four, you will leave Húsavík, to the valley of the Loðmundarfjörður fjord. Throughout this hike, you will be surrounded by dramatic mountain peaks. Perhaps the most interesting feature, however, is the site where a mountain collapsed, called Loðmundarskriður. Though it has been this way for thousands of years, the enormity of such an event still clearly marks the landscape. You will reach the bottom of this fjord by evening, and find the cabin you will be staying at. Like the previous night, you can have a wander through this area to another historic, abandoned church. 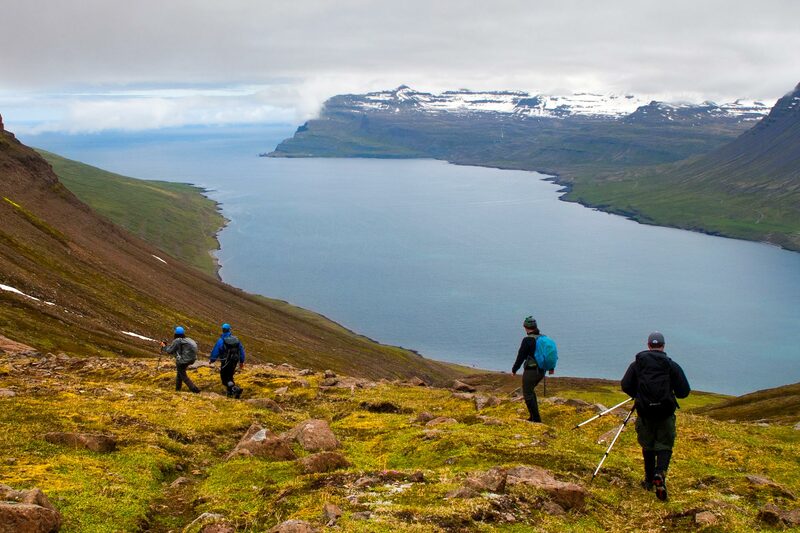 For the final day of this excursion, you will follow a path called Hjálmárdalsheiði, which for centuries connected the rural Loðmundarfjörður to the harbour town of Seyðisfjörður. Each ascent through this mountainous region will reward you with stunning views of the fjords to the south. The final fjord that you come to, however, is very distinctive when compared to the others; it is narrower and surrounded by steeper, more dramatic peaks. You will descend towards Seyðisfjörður, but will not need to hike all the way there. Once you reach the main road, you will find your bus, which will whisk you back to Egilsstaðir, in time for an evening return flight to Reykjavík.